Turn and face the circuit… ch-ch-change it! The 49 year-old man from Everything ECMO 11 is on day 12 of VV ECMO. Overnight he developed epistaxis following an NG re-insertion, and the bedside nurse tells you there has been increased oozing from his cannulation and central venous catheter sites. The bleeding is such that he has required two units of packed red blood cells to be transfused. He has been anticoagulated on a heparin infusion while on ECMO. His hemodynamic supports and ECMO flows are otherwise unchanged over the last 48 hours. His lung compliance remains poor with tidal volumes of 100ml on SIMV PC 10cm H20 PEEP 15 cm H20. Q1. What is the differential diagnosis for diffuse bleeding in a patient on ECMO? Device related fibrinolysis. This typically occurs with “older” circuits (> 7 days). Technical considerations — for example, percutaneous cannulation using scalpel incisions may result in bleeding around the cannula site. This can be prevented with meticulous “no-scalpel” insertion technique, ensuring there is a tight seal of the skin around the cannula. Q2. What investigations are useful? In addition, basic information such as a full blood examination/complete blood count, coagulation profile, blood gas, calcium level and patient temperature are important in the management of any bleeding patient. The patient’s D-dimer today is 127 microg/ml, increased from 69 microg/L and 52 microg/L on the two previous days. His PTT is 53 seconds, INR 1.8, fibrinogen 0.8 g/L, platelets 52 x 10^9/L. Plasma free Hb <0.01 g/L. Q3. What do the results shown in Q2 suggest? The likely cause of bleeding in this patient is circuit-related fibrinolysis. The patient is not excessively anticoagulated on heparin as demonstrated by a PTT at the low end of the target range for an ECMO patient. A low plasma free Hb suggests that haemolysis (and therefore, thrombus) is not a major issue for now. Fibrinolysis is characterized by high D-dimer levels and decreasing fibrinogen concentration. Decreasing platelet count is often seen (however, in one study this did not reach statistical significance (Lubnow et al, 2014)). Q4. What is the treatment for this problem? The circuit is driving the patient’s fibrinolysis. Given that he is still dependent on VV ECMO support, decannulation is not possible. Thus a circuit change is indicated. Bleeding as a result of fibrinolysis may respond to systemic or topical antifibrinolytics (Murphy et al, 2015). Q5. What considerations should be made in preparing for a circuit change? A circuit change in an ECMO-dependent patient requires careful preparation. A circuit change requires ECMO support be stopped for a brief period of time while the circuit is exchanged. If the patient is very dependent on ECMO for support, they may deteriorate dramatically. The procedure is most efficiently performed by 4 sterile operators (two people for each side of the circuit; one person will cut/connect and the other will provide an underwater seal), a dedicated ECMO console operator (both the old one and the new one), and a separate Team-Leader to oversee patient management. With effective teamwork, circuit change time can be halved compared to 2 sterile operators. This can allow the patient to be off ECMO support for <30 seconds. there should always be a primed circuit available, and relevant equipment should be easily accessible as circuit changes may need to performed emergently. Q6. How is a circuit exchange performed? Clean the access and return tubing of the current circuit with iodine based antiseptic and place sterile drapes. You will not want to add excessive length to the circuit, but do not cut too close to the cannula. There are a number of case reports related to circuit rupture when splicing of a new circuit is performed at the cannula site. A clean cut in the tubing distal to the cannula is preferred. Once gowned/gloved, clean the access and return tubing of the new circuit then clamp and cut. Simultaneously clamp the return and access tubing of the current circuits using two clamps for each line. A clamp is also placed on the circuit by the ECMO console operator at this time. The patient is now off support. Cut the tubing between the two clamps, allowing enough ‘wiggle’ room. Then attach the patient end to the new circuit with the other end of the 3/8”-3/8” connector using an underwater seal. Ensure access and return lines connected correctly. 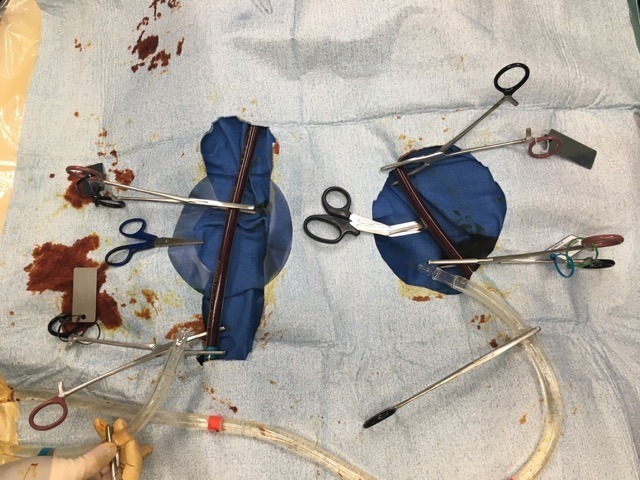 Ensure that no air bubbles are visible and remove all clamps, and re-establish flow on the new ECMO circuit. Twenty-four hours after the circuit change your patient’s d-dimer is now 68, fibrinogen 2.1, PTT 52 and INR 2.2, platelets 87 x 10^9/L. The patient has stopped oozing and has not required any further transfusions.